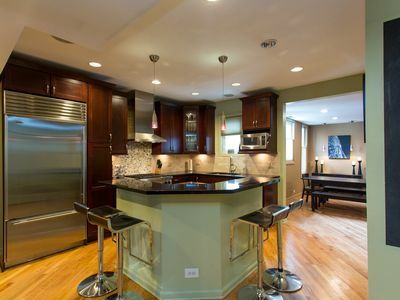 Exceptional 3700sf Brownstone (sleeps 8-14) located in a Chicago's charming Lincoln Park historical neighborhood. Please note that it is on four levels and it is not ADA compliant. Also, as you plan your travels to and from our vacation home, check-in time begins at 4pm and check-out time ends at 11am. 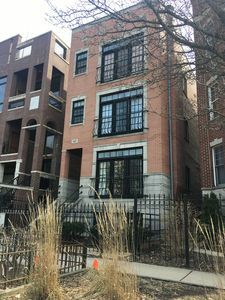 We’ve previously rented vacation homes in Wisconsin and Nantucket for use by our family and friends and we were disappointed with the availability of large rental homes close to downtown Chicago - although there are plenty of Condos. 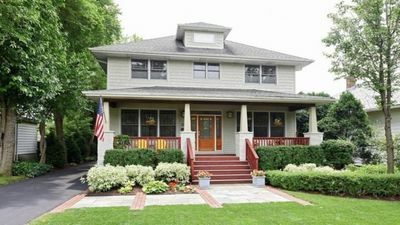 So, we recently acquired this historic home, which features various sleeping configurations for large multi-generational families on multiple floors, recently updated kitchen and baths, a lower level suite perfect for seniors or an au pair/nanny, 1-car indoor attached garage for parking, nearby parks, shopping and restaurants galore. This is a perfect residence for a large multi-generational family's vacation in Chicago, a wedding party's out-of-state relatives, a ladies shopping trip to Magnificent Mile, an executive's temporary assignment to Chicago, an executive attending a Master's Program at Loyola, Trade Show attendees/exhibitors, Chicago marathon runners, a Chef attending Le Cordon Bleu College or an actor during a role in a Chicago Broadway play or musical or in a Chicago filming. 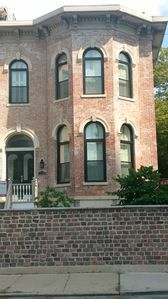 Located at 2000 North Orleans, the residence is located only a short 1-block stroll east to Chicago's historic Lincoln Park (home of the Lincoln Park Zoo and from mid-May a Farmer's Market every Wednesday and Saturday during through Fall) and is about a mile from the famed-North End of Chicago's Magnificent Mile of Michigan Avenue shopping and restaurants. Nearyby Restaurants include Home of Wrigley Field's StanBurger, Stanley's Bar & Grill, an Original House of Pancakes for a big breakfast, famous for its BBQ Baby Back Ribs is Twin Anchors, but nearby Four Farthings has awesome ribs as well as wonderfully large portions of Italian fare, Trattoria Ricardo's has great Italian as well, on Halsted is Summer House serving great American fare. Next door to our home is a great Thai restaurant, Geja's upscale Fondue style restaurant, Dog Joint for awesome Italian Beef and homemade spicy Italian Sausages Plus a Subway Restaurant for a quick casual sandwich. A block away is Mello's also good for great Italian Beef, Italian Sausage and Combo Sandwiches - guaranteed to fill you up! In addition, our vacation home is about 1.5 miles to Chicago's infamous intersection of State Street & Rush Avenue, home of the following great gastronmic experiences: Gibson's Steakhouse, Morton's Steakhouse, Tavern on Rush, Hugo's Frog Bar and Fish House, Carmine's Italian, RA Sushi, and Dublin's Irish Pub. Check out the map and some of our recommendations by copying and pasting the following link to your web browser: http://bit.ly/1CTwq2N. 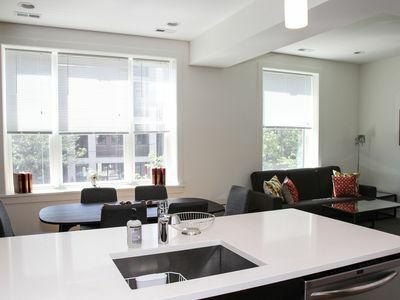 Street Level (Level 1) – (sleeps 6) Entry from 1-car garage off of Orleans Street. 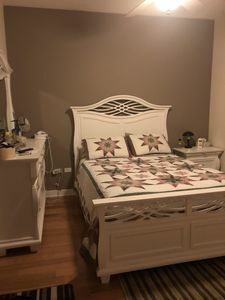 Or, enter from the front courtyard lower level entrance directly through the entrance is a Bedroom (King Bed & Sofa Sleeper) perfect for Seniors, Au Pair or Nanny, which has its own Full Bathroom. The Lower Level also includes another ensuite Full Bathroom and Bedroom (two TWIN beds which can be configured as a KING bed upon request). 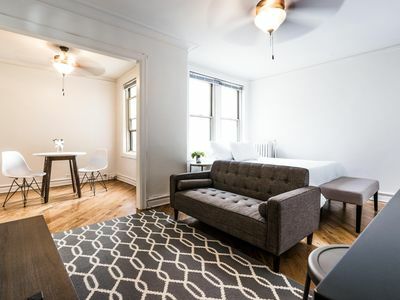 Each lower level bedroom has interior stairs to the next level up and between the two bedrooms is a hallway table with coffee maker and microwave. 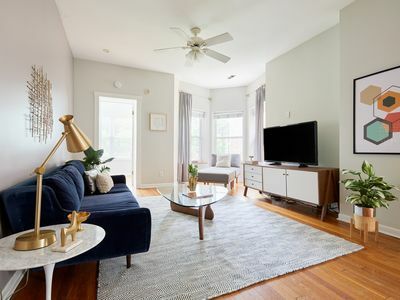 Parlor Level (Level 2) - (sleeps 0-2) – Climb the front courtyard stairs to the Main Living Area including Living Room (with Queen Sofa Sleeper), Dining Room (Seats 10), Full Bathroom, and Kitchen and a Deck overlooking the tree terraced Orleans Street (with BBQ). 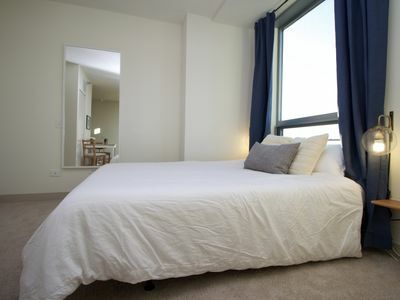 Third Floor (Level 3) - (sleeps 4-6) – Master Bedroom (King) with ensuite walk-in shower for two, and a Guest Bedroom (King) with ensuite Full Bathroom. 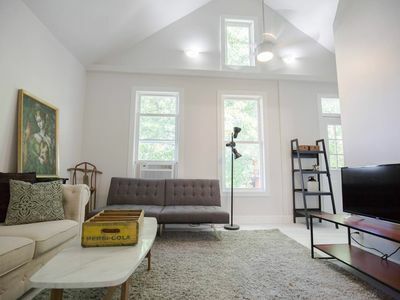 Plus, there is a bonus library room with two Day Beds for extra sleeping requirements or simply an area to sit and converse. 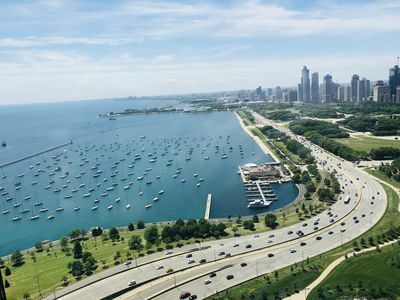 Top Floor (Level 4) - small room with desk & printer with an access door to Roof Top Deck - enjoy the sun and views South to the panoramic City of Chicago skyline. 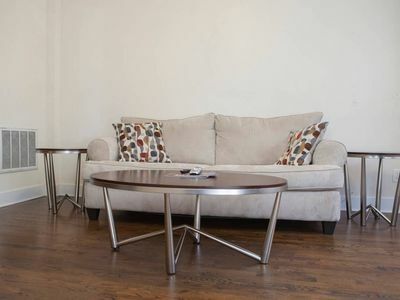 If you stand on your tippy toes, you might see Lake Michigan to the East... Plus, it has patio furniture, BBQ & Fridge. 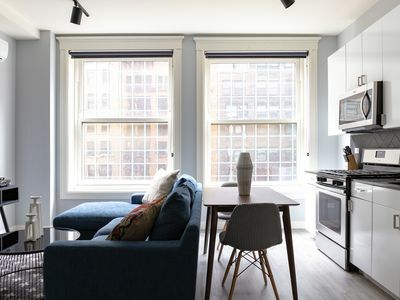 NOTE: The State of Illinois and the City of Chicago licenses short-term vacation rental properties and collects a combined 20.4% Hospitality Tax/Surcharge. The licensing process includes a physical inspection of the property. 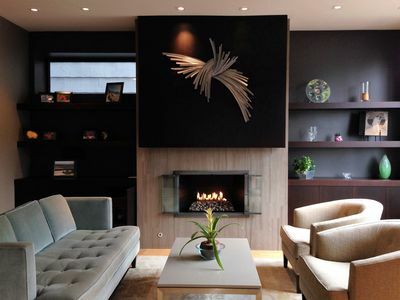 Following our renovations, we have secured our City of Chicago license #2340328. Please become knowledgeable regarding the risks involved of renting an unlicensed vacation home. WARNING: This property is available exclusively through VRBO and HomeAway and their affiliates. 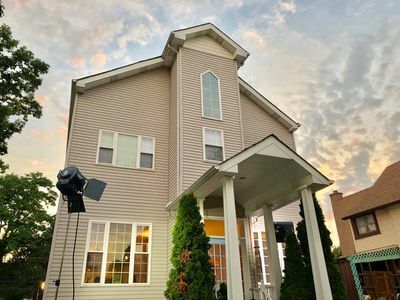 Beware of fraudulent listings on Craig's List using some of our home's photos and descriptions, but maybe using a slightly different address or possibly the same address. We do not advertise on Craig's list or any other sites. NOTE: We donate 1% of our total revenues in memory of Moreland Grace Stenstrom to the charitable works of The Peapod Project in Chicago (www.thepeapodproject.org), which benefits Chicago's Lurie's Children's Hospital. We thank you. 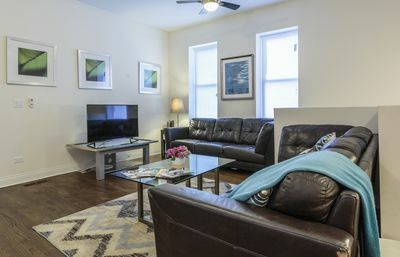 Lincoln Park Living - Suite 3 - 3 queen beds / sleeps 6! 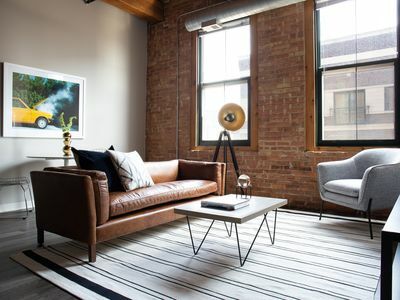 Recently Gut Rehabbed Unit In One Of Chicago's Trendiest Neighborhoods! 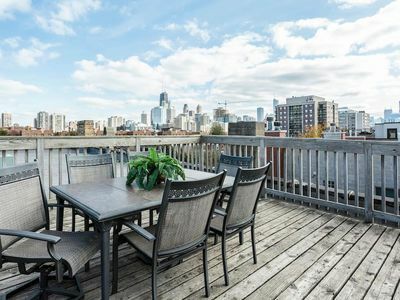 The Downtown Chicago Dream Condo: City View Roof Deck!